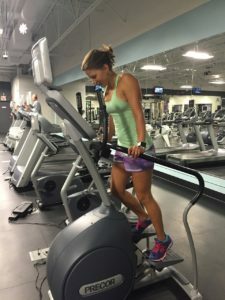 Question: What is the most effective method of doing cardio? I hear conflicting reports about how high intensity is better and those who say the lower intensity burns more fat. Which way should I go to get the best results? Answer: The high intensity cardio elevates your heart rate to very high levels and sustaining that level for 20 to 30 minutes creates an aerobic effect which means fat burning. You still are using glycogen, stored carbs, for energy as well during this type of training. This method has become the standard in the industry but it has its drawbacks as well. Not everyone has the physical ability to handle a sustained high heart rate and some people have injuries which interfere with some exercises. The alternative is a slower lower intensity cardio that elevates your heart rate to 60%- 70% of your maximum. The consensus is that the lower intensity causes the vast majority of energy needed for the exercise to come from stored fat. The drawback for this is the time required to see noticeable results and the actual duration of the workout which is typically 40 minutes to an hour. The best method is a combination of the two styles: For high intensity cardio, full body exercises challenge more muscle groups and require your heart to work harder. Choose from three to five exercises in a sequence that will work all your major muscle groups and repeat the cycle as many times as you can for 20 to 30 minutes. On your next cardio day change the exercises and the sequence and set rep requirements for each exercise. For instance if you chose pull-ups and push-ups you would do 50 reps of each exercise in as many sets as you needed to accomplish your goal. For your third day use a treadmill on its highest elevation and simply walk at a steady pace with long strides for 30 minutes. Just keep rotating the training cycle making changes as you go to keep the workouts challenging. One final thought: you can’t out train a bad diet.